With a magnitude of 6.9, the spiral galaxy M81 in the constellation of Ursa Major can even be seen with the naked eye by an excellent observer under a very dark sky. It was discovered in 1774 by J. Bode, and Charles Messier entered it in his catalogue of nebulous objects in 1781 along with the neighbouring M82 galaxy. Observations using the Hubble space telescope on variable stars of the Cepheids type in the galaxy have made it possible to determine its distance to be 12 million light-years away. 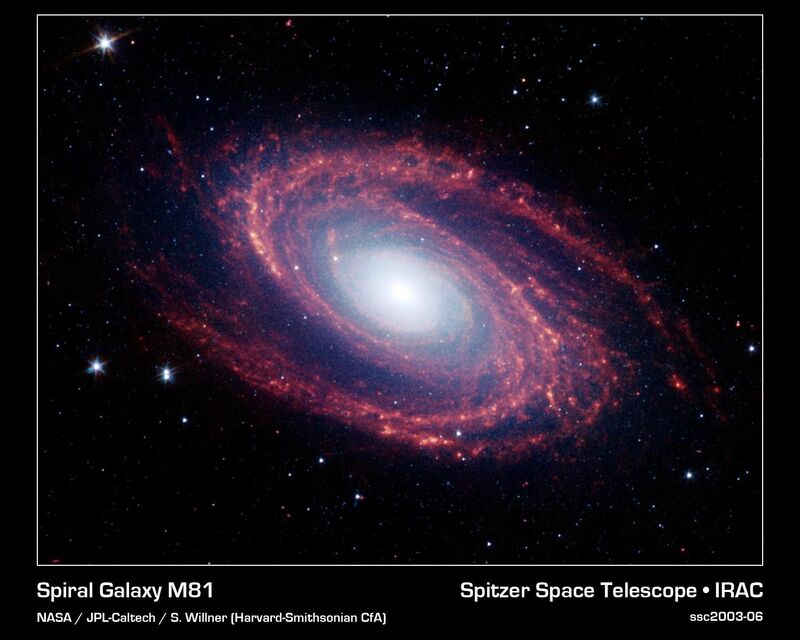 In 1993 a bright supernova (magnitude 10.5) was discovered in M81 by an amateur Spanish astronomer, F. G. Diaz. M81 is the most imposing of a group of four galaxies; the other 3 are M82, which, in the relatively recent past was a victim of gravitational disturbances caused by M81, and the NGC 3077 and 2976 galaxies. Similarly to our Milky Way, the edge of M81 contains about 200 globular clusters.